NEVADA COUNTY DEMOCRATIC CENTRAL COMMITTEE DEMOCRATIC CANDIDATE FOR PRESIDENT? 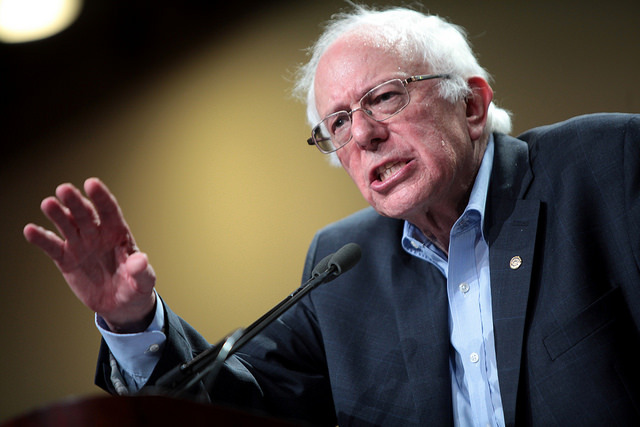 Bernie Sanders says Denmark is socialistic and a model to be emulated in this country. He is wrong about the first part but right about the second one. I urge readers to google “Socialist Denmark +Bernie Sanders” for general background information. Bernie Sanders is in fact trying to claim credit for an economic system in which moderate Social Democrats have kept Danish Socialists on the periphery of influence, much to their chagrin. At its core Denmark is a capitalistic country where private enterprise is under quite extensive public control so that both the upper and lower income Danes benefit. It is a market economy with a great deal of governmental regulations, high progressive taxes particularly on the wealthy, high wages, excellent working conditions, and an exceptional social safety net. The US today could have been a bit like Denmark if the white American working class voters had embraced the civil and voting rights legislation of the 1960’s and had continued voting for Democrats to advance their own wages and living standards, expand public infra structure investments and improve the social safety net. This is what working class voters have done in other advanced democracies around the world. Forbes Business Magazines ranks Denmark with its high salaries, very high tax rates for particularly the wealthy, and expansive social safety net the third best country in which to do business. The US is rated in the eighth position with its low salaries, lack of lack labor unions, and very low taxes for the wealthy. You will never hear Danish Social Democratic politicians rail against “the millionaires and the billionaires” because they realize that good jobs, improving opportunities, and rising living standards for average citizens is indeed dependent on those with great wealth and/or exceptional entrepreneurship. The right wing media have controlled the political narratives in this country for decades, and have effectively labeled even moderate Democrats Socialistic as our country gradually moved toward the extreme right. The right-wing has also diminished the economic successes of our many allies around the world by calling countries like Denmark socialist. So perhaps this is why the Bernie Sanders false claim so far is going largely unchallenged. If we choose Bernie Sanders to lead our party during the 2020 election we will find he will have much bigger problems than just his decades worth of support for the NRA and the weapons industry, or the sexism during his 2016 campaign, or his wife’s very questionable financial decisions, or his age, or the Russians bots aiding his campaign against Hillary Clinton, or the startling similarities of some of his views and concepts to those of the extreme right. The media have coddled him as an alternative to main stream Democratic candidates but as the Democratic candidate he will be grilled about his actual political beliefs. His 1988 visit to the Soviet Union with its gulags, bloody suppression of dissent in Hungary and Czechoslovakia and its total control over its own citizens and the rare Western visitors that were allowed there will be breathlessly discussed. Russia will likely produce his actual visa application in his own writing to the Soviet authorities, and very possibly this application will express his interest/admiration for the Soviet socialist system. I am sure Russia will be delighted to provide their right-wing friends in the Republican Party with this information. The old Socialist notion that the rich and the powerful would inevitably create such poverty that the proletarian masses would revolt has failed to materialize due to democracies developing around the world so that the abuses by the most powerful were reined in. The one really major exception to the continued growth of wealth and security for even low income people in the rest of the developed world is the US during the last forty years, but it is not for the reason that Bernie Sanders is laying out to advance his political vision. A very successful campaign by a very small group of sinister corporate interests did begin about half a century ago, and it has resulted in the Republican Party now being under their total control. Their racist and anti-government rhetoric appealed to previously Democratic groups of mostly blue collar working class and Southern voters who fell for the myths and false narratives. These voters have been the foot-soldiers fort the most extremist factions of the Republican Party. Bernie Sanders is convinced that he can reach the Rush Limbaugh blue collar voters that for many decades have enabled the Republican Party to become so extreme. But his blatant appeals to these in my view largely unreachable voters will be a real problem to not just black voters, our most faithful group, but also to women and the older educated white middle class voters that demonstrably have led to our many successes in the 2017 and 2018 elections. The fact is that the vast majority of our recent impressive wins would not have occurred if Bernie Sanders had been campaigning actively on their behalf so why some people believe he could succeed in a national election is a mystery to me. Just because something is a mystery to you personally, doesn’t mean that it’s a mystery to everyone else. Take my mother in law for instance. She says she hasn’t figured out the dinosaurs yet because she thinks the earth is only 5000 years old. I’m not sure what everyone else living in reality is supposed to say to her about this. The earth is not 5000 years old, so where does one even being in having a factual conversation about Dinosaurs or science or reality in general with someone with such strong cognitive dissonance? The same could be said for Democrats who don’t seem to understand the “mystery” behind Bernie Sanders and his widespread appeal and popularity. There really is no mystery here at all. I know we are all unaccustomed to legitimately good human beings working as politicians who care about other people more than corporate profits. We’ve been told our whole voting lives that those people don’t even exist. That’s a big reason why Sanders has such strong support, and yes that support does stretch across the isle. Not even kidding, MOST of the republicans I personally know who voted for Trump, (Republican voters aged @ 30-45) we’re supporting Bernie in the primary before the DNC gave the nomination to Hillary. They would have voted Blue in the general if Bernie was an option, but he wasn’t. These same voters never even would have considered supporting Hillary Clinton, or any other Democrat for that matter. They liked and trusted Bernie because Bernie has been fighting for working people all his life. They like that he’s a political independent above being a political puppet to a political party. He’s one of the only politicians that people feel they can trust. That also why Bernie Sanders won Nevada County by such a large margin. So perhaps it’s wise to keep that in mind when you’re writing for a Nevada County Democrats publication. Nevada County Democrats Support Bernie Sanders along with his progressive policies. He’s not a mystery to us. He’s just a mystery to you. This “piece” reads like it was written by a Republican Moderate trying to trick all the Democratic moderates into supporting another moderate candidate who isn’t going to be able to win in the general election. AGAIN. We can’t afford to take another chance at losing in 2020. The planet can’t afford it either. We need a slam dunk Dem victory. We have 12 years to respond to climate change before the course is irreversible. We have 30 years before all ocean life is extinct. What on EARTH is any political moderate going to do for us to fight climate change with moderate changes and incremental steps to improvement while they’re all so pathetically preoccupied with keeping the millionaires and billionaires happy and drowning in their own glutinous wealth? I just don’t trust a moderate Democrat to be able to get the job done that’s required of them. They don’t seem to believe or grasp the urgency of climate change. They’re more worried about their retirement accounts than saving ocean life from extinction. We have 12 years to change everything and moderates only want a little bit of change at a time. Supporting a moderate right now is like signing your own humanity’s death warrant. You suggest I am a subversive Republican infiltrating our local Democratic Newsletter and then say you and your conservative friends would never vote for a main stream Democrat anyway; particularly Hillary Clinton who had the most detailed, realistic and progressive platform of any previous candidate for president. For about half a decade I have been published regularly in the Union and elsewhere in trying to do my little bit in stemming the scourge of the right-wing that is threatening our country and our democracy. In a better world I believe in high progressive taxes by all and extensive government subsidies for not just housing, education, health care, child care, parental leave, even nursing homes and assisted living similar to what they have in Denmark. But this is not Denmark where a sense of the common good is very strong and people accept paying necessary taxes. Some of your remarks support the notion that Bernie Sanders is hoping to tap into the toxic stew of right-wing resentments and hates in the belief that these many tens of millions of American conservatives reared on decades of right-wing disinformation will see the light from his superior wisdom. I believe it is much more likely he will further alienate blacks, our most faithful voter group, as well as women and educated older white upper middle class voters that have led to our many election successes in 2017 and 2018 with his insistence that conservative voters that he is aggressively courting are not racist at all; much like Donald Trump has been doing for three years now. We have very strong center-left candidates, black and white, women and men, with progressive messages that are not built on some of the same myths and false equivalencies that the right-wing has been using with great success, and that Bernie Sanders is basing his campaign on. They also do not have the heavy baggage of either Hillary Clinton or Bernie Sanders that three decades in the political limelight inevitably produce. Parties evolve to take in subgroups of voters. The Republican Party were the environmentalist under Theodore Roosevelt and the Democratic Party was the racist party having the Dixie crats. What we are seeing now is the evolution of the Democratic Party and the devolution of the Republican Party. It probably started with Al Gore then was crystallized by Bernie. Now look at how many Democratic candidates are supporting progressive initiatives. If Bernie wins the Democratic nomination great. If not we all better support who ever does. But either way the truly important thing will be to have progressives in the majority in the House and Senate. Or nothing will get accomplished.